Register ONLINE HERE, or download the flyer and mail it in Harvest Hoedown 2018 Flyer. Click HH 2018 Dance Schedule – 9-12-18 for the up to date schedule! This is subject to change. New Dancers who start dancing with a club in Sept or Oct., this package is designed for you! Although there will not be new (not exposed to square dancing yet) lessons, the callers will assess the skills of the dancers there and teach appropriately. It is ideal if the dancers come with knowledge of calls 1-24, but not required. There is dancing all day Sat. and Sat night to help you along in your skills. There is a very special clothes closet just for you as well. Square dancers donate their lightly used items, for both men and woman, so come shop and take for FREE! There are dresses, skirts, blouses and petticoats for women, and shirts, slacks and ties for men. Some are matching outfits, so don’t miss out! Come early to get your shopping done to wear to the dance on Fri. night! The New Dancer registration form will be available when the classes start in 2018. Participating in this all-day, interactive workshop. We’re offering members of our square dance community the opportunity to meet with other dancers and callers to share ideas to improve our activity. No experience needed—just a willingness to learn from other dancers or share your own ideas. Come in Thursday night for the Trail’s End Dance, then spend the day Friday interacting with other dancers. This year’s theme has not yet been determined, but we’ll share ideas and explore ways to remind the public that square dancing is still here and still amazing. We will use an open forum format with topic moderators. Everyone will be encouraged to share ideas, experiences, and challenges faced allowing the group to explore options that might prove successful in your own areas. The $10.00 registration fee includes your lunch. Session starts at 9:30 am on Friday, Oct. 27th, 2018. Boot Camp starts at 9:00 – 3:00, $25.00 fee includes lunch. Download form Caller Boot Camp flyer or register ONLINE. Individuals or groups create a Scare (square) Crow. We will line the entrance to the Plus Hall with the Scare (square) Crows this year. Surprise judges will then decide which one is the best Square Crow, and the winner receives one free Harvest Hoedown ribbon for the following year. Get your square together in a no holds bar mainstream tip. All featured callers will call this tip Saturday night a 6:30 pm. Each square will have a judge watching them…..last square on the floor wins- prizes and Bragging Rights. Come join in the fun or just watch the fun! We are working on updating the rules for the “Riot Dance” and will post the new rules as soon as they are available. The theme for this years fashion show is “Four Seasons”. You wont want to miss this colorful event. We are sure you will want to show off your favorite Square Dance outfit, or get your club involved with their “club outfit”. Come join us Saturday at 12 noon for fun, fashion and door Prizes. This will be hosted in the Advanced Hall, Franklin. There will be entertainment provided by Bill and Leslie Rebik, who will be teaching and leading line dancing. On Fri. night, we encourage dancers to wear pink for our Breast Cancer Awareness night. A sea of Pink everywhere is a beautiful sight indeed! RV and Tent: Large grassy areas with water and electrical. Dump station is available on site, as well as restrooms and showers. Be sure and contact the Wagonmaster@asdsc.org if you are camping as a group. We are pleased that the following vendors will be featured at the 2018 Harvest Hoedown! Be sure and visit the main (Plus) hall for these vendor offerings. Creative Beverage: On site Food. 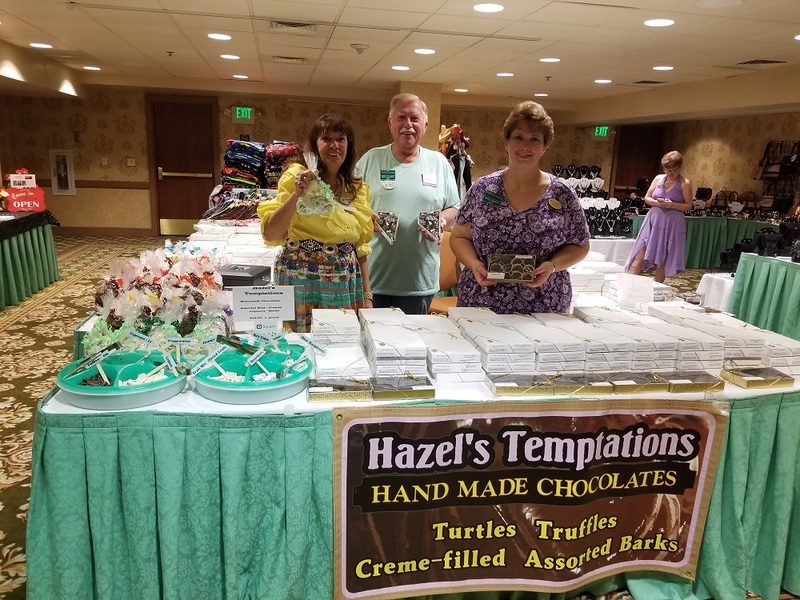 Hazel’s Temptations: Homemade “cottage” chocolates, located in Carson City, NV. Handmade creations include fruit-flavored creamed filled, caramels, mixed nuts in chocolate, peanut butter, liquor filled, barks – broken up chocolate (white, milk and dark) with various flavored candies or dried fruits mixed in. 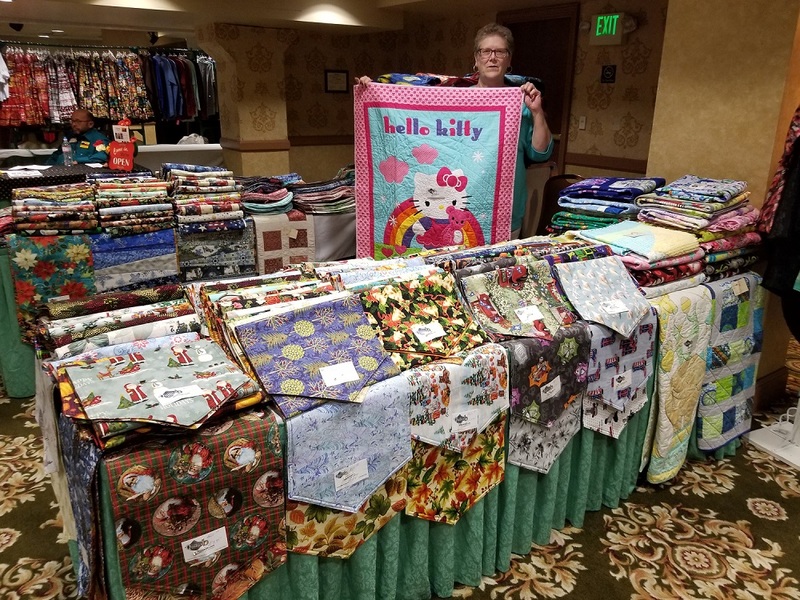 I have been a vendor at Nevada’s Silver State Festival for 4 years. Stop by the booth at the Harvest Hoedown and see what all the sweet talk is about! If you have a special request before the festival, please call me, Hazel Graf, at 775-461-0260 and I will help with that request. Sugar free chocolates are not available. Signs By Scott: Signs By Scott offers a wide variety of engraving, dye-sublimation (printing), and vinyl signage services. We offer engraving of name badges, club badges, name bars, and many other custom made and personalized items. We welcome any and all who would like to help with Harvest Hoedown! This is an all volunteer event and we appreciate every person and/or club who contribute to this success. Volunteer at the registration desk: Answer questions, give directions, help with registrations, hand out ribbon packages. Anyone who volunteers for 2 hours will receive a $5.00 voucher toward any vendor at the festival! This is available to anyone, and it doesn’t require special skills! Please contact Barbara at treasurer@asdsc.org. Donate a basket for the Silent Auction: If you or your club would like to donate a basket for the Silent Auction, please be sure and put a list of the items on the outside of the basket. We need Silent Auction items no later than 6 pm on Friday night. 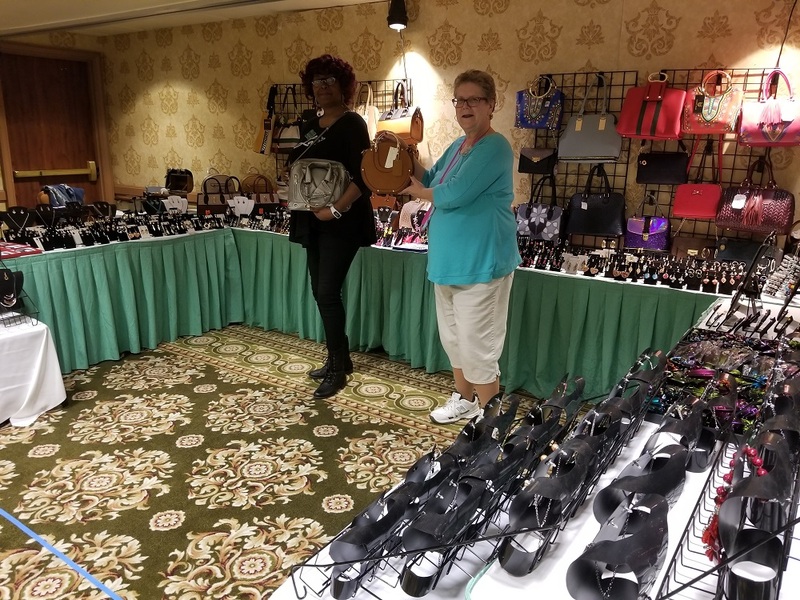 Donate items for the Silent Auction: If you have any special items that might fit together into a basket (we put the basket together for you), or would like to donate something individually (Bird house, Jewelry boxes, petticoats, etc. are examples), then we can have them stand alone at the auction. Volunteer at the sewing center. Participate in the Square Crow Contest, Fashion Show, and Riot Dance.